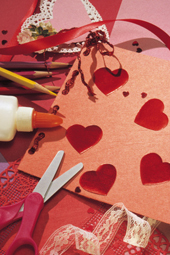 Use red construction paper to cut out hearts that are slightly larger than the lollipop. Glue hearts to lollipop wrappers. Fold green construction paper in half. Cut out oval-shaped leaves. Unfold each double leaf, coat the inside surfaces with glue, and then close the double-sided leaf around a lollipop stick, so that one side of a leaf sticks to the other. Put one or more leaves on each lollipop stick. Draw or print hearts on colorful paper. You’ll need two hearts for each valentine. Write a fun or sweet message on half of the hearts (Example: “you’re in my heart”). For each valentine, staple two hearts together along the outside edge, leaving the top open to create a pouch. Use staples to close the top of each valentine. Fill each cellophane treat bag with candy or cookies. Cut construction paper into rectangular strips that are the same length as each treat bag’s opening. The strips should be wide enough to fold over the top of a treat bag. For each treat bag, fold one strip of construction paper over the top and then staple the strip in several places to seal the bag shut. Write a name or message on one or both sides of the construction paper sealing strip. Although it may be tempting to buy Valentine’s Day cards at the store, homemade cards such as these are more likely to be treasured by both your child and the recipient.